I did some training with Chris Dickinson of Spean Bridge. 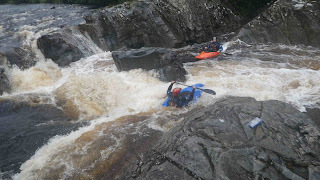 I don’t get enough opportunities to get onto higher grade white water rivers and it was great fun to try some new rivers with people who are enthusiasic about the sport. Unlike with low level coaching courses which are often populated with people who work for councils, the leadership awards are generally for people who are strongly into canoeing. 5 Star Leader is pretty similar to 4 Star Leader but on heavier water. We started out on the River Roy and ended up doing the entire length of it. The rain was on much of the day and the water was rising throughout. While at 4 star level you have four or so hand signals, at 5 star water grades (3-4 with some 5) the chances of needing to communicate complex commands at distance is much higher and we were given a list of about 20 commands to find signals for. We did some skills which I found very easy, maybe the slalom that I’ve done means I can put my boat on a desired wave on demand without having to think about it. We also did some foward paddling tuition which most of the other paddlers had never done but is the sort of thing I do every day in a racing boat. So crossing over disciplines does help a lot. Curious that my skills were marked as being very high when on my 4 star assessment they were considered my weak point, maybe I’ve improved a lot with more hours on the water recently or maybe there’s just a high degree of chance. On an especially large wave in a gorge section I was folling a paddler who capsized and swam which put me off at just the wrong time that I was soon in the water too, although I tried a roll a few times the water was too airated for it to work and I came out, most disappointing. By the end of the day the river was in spate and we had to paddle fast to get to the egress before it became too dangerous. The get out involved using microeddies behind trees and a steep climb up banks with roaps, quite an impressive team effort. The evening was spent discussing interesting topics like catchment areas and flow rates and finding rivers. Spean gorge was our paddle on day two and was a large river in lovely surroundings. We did some rescue scenarios which are always worth practicing. At the grade 5 rapid I had another capsize but made the roll which kept me happy. My leadership wasn’t as good as I had hoped, it’s hard to find the balance between instructing people and giving them free rein within boundaries, on coaching and leadership courses such as this people are usual feel the need to follow orders rather than use their own experience, on real paddles the opposite is true with experienced paddlers. We learned an interesting double roll, if you feel your first roll is failing you can swap the paddle blade round quickly and use the momentum to help you roll up on the other side. I’ve tried this in a pool since and you have to be very quick and preferably have nose and ear clips to stop your head filling with water. We also did a draw stroke on the move which is something I should practice more. We learnt why hanging draws are a bad idea, there’s a risk of objects in the water hitting the paddle, I’m glad of this since I never saw the point of a hanging draw anyway. We covered an eddy spin move which is using eddies to spin your boat quicky and gracefully so you can get a view of the complete river without losing too much forward momentum. Finally we stopped and listened to the sound of nature and considered ourselves lucky for being canoeists who can see it close up from a view few others can. All good fun and very interesting. I highly recommend Chris as a coach. Now I just need to find 30 paddling days on high grade white water to be able to pass the 5 star assessment.